Decorating for fall is my absolute favorite. I adore all the pumpkins, leaves, and apples, and I love to add little touches to as many rooms as I can. It’s also a time to do a little sprucing, and I was able to focus on my bedroom– I even found the perfect nightstands and lamps! 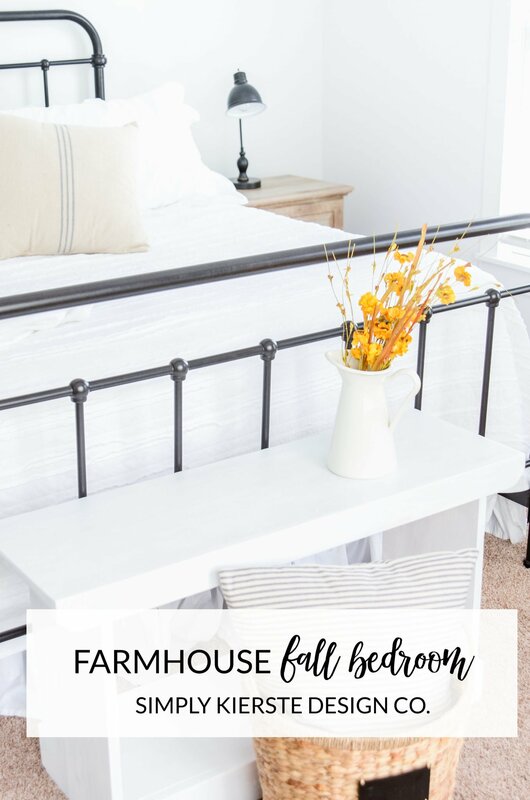 Now our little farmhouse bedroom is ready for fall, and I love it! First on my checklist? Nightstands! I have been looking for nightstands for awhile, and just wasn’t having much luck. 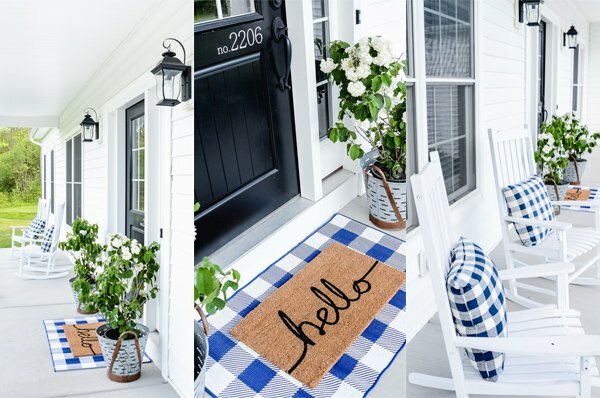 I thought maybe we would build them, but it was pretty far down on the project list, so I was thrilled when I found these darling ones by Better Homes & Gardens. 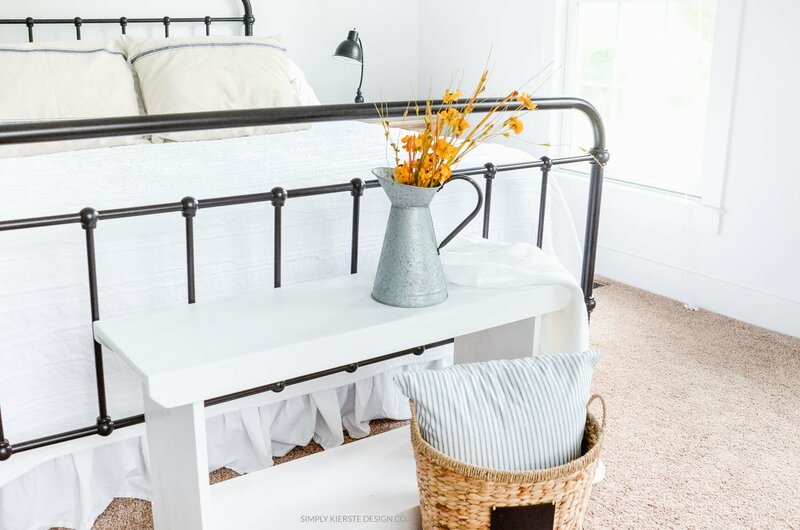 The weathered look fits perfectly with my farmhouse bedroom, and with two large drawers, we have plenty of storage space right next to our bed. I used this lamp in my music room, and I loved it so much in there, that I decided to get a couple more for our bedroom. I’m so glad I did–they’re exactly right. They’re big enough—but not too big–and go so well with the rest of the room. For the bed itself, I really needed a new set of sheets, and surprise, surprise–white is my favorite. 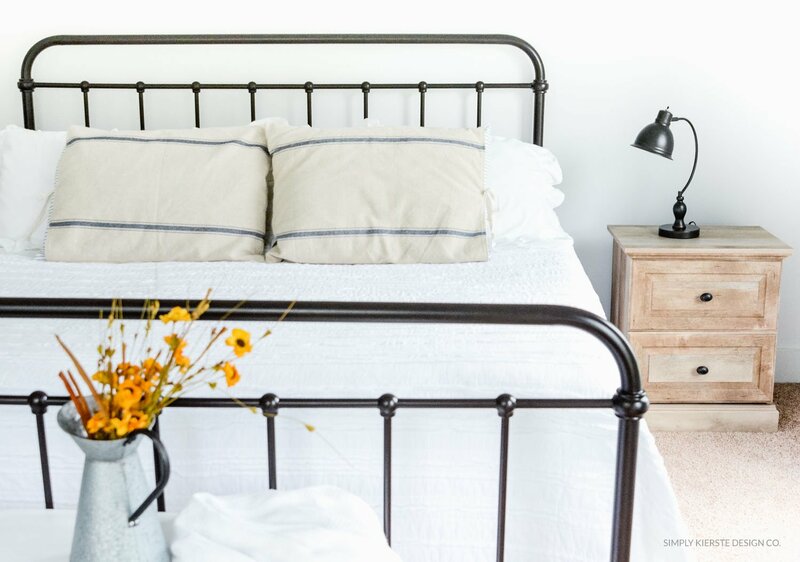 I adore these 400 thread count Egyptian sheets–they’re just want we need for the cooler fall months. I also found a white cotton throw that looks darling on the bed when it’s not in use, and super cozy when it is! 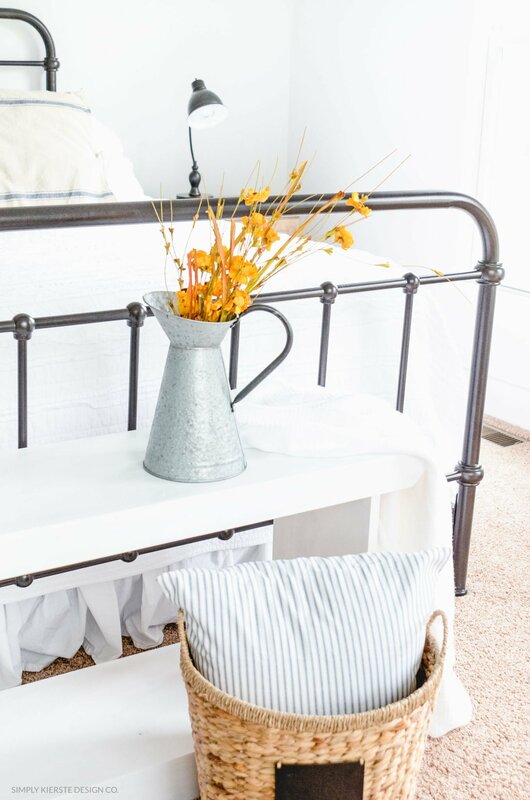 I love keeping a basket in my room too…for throws, pillows, etc. 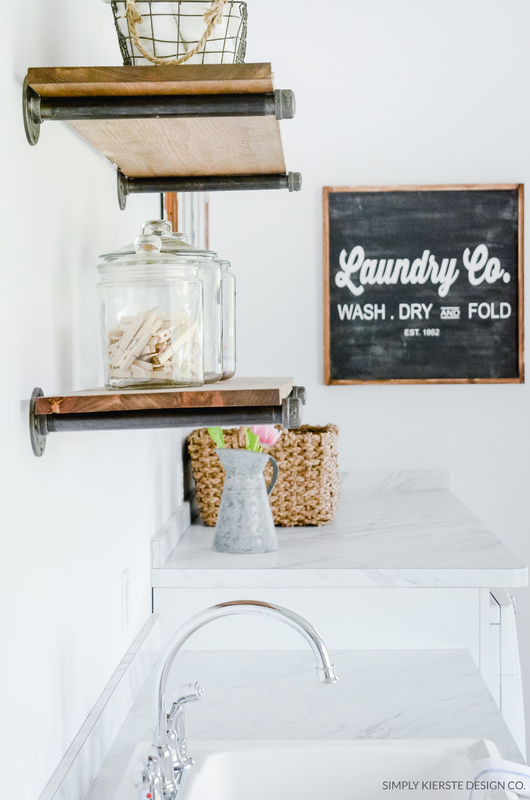 It’s functional, but is also so cute, and just adds to the overall look of the room. 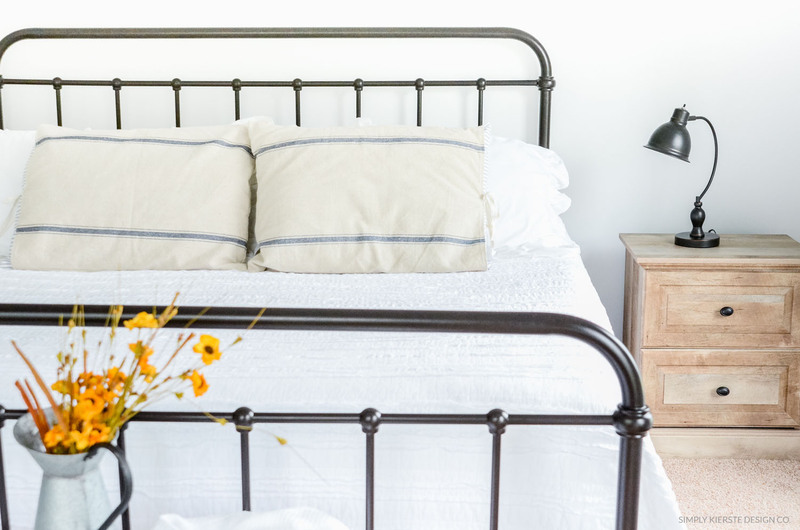 Ticking is my absolute favorite in the fall, and I decided to use that throughout my home. I tucked a pillow inside the basket, and it’s perfect. We made the cute white bench at the bottom of my bed, and my husband thought it would be for sitting…I think it’s for decorating. Ha! We will have to compromise. 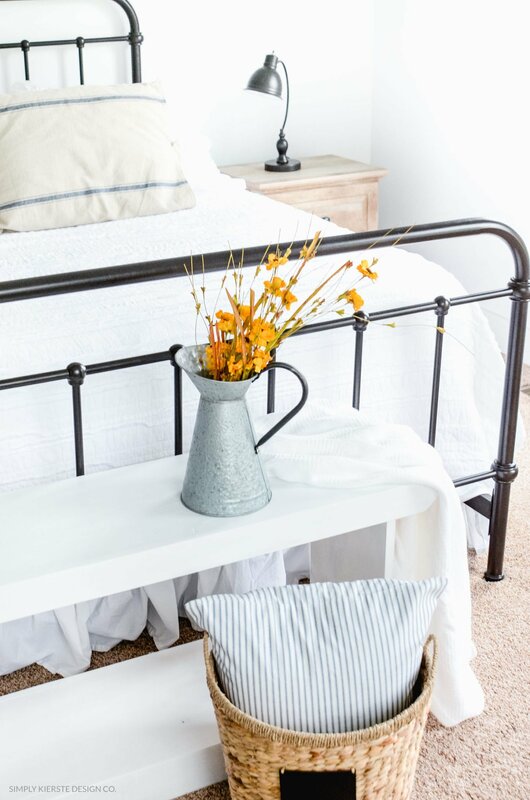 In the meantime, a lovely galvanized pitcher full of yellow flowers pulls the whole room together, and gives it the little pop of color it needed. They bring fall into the room! 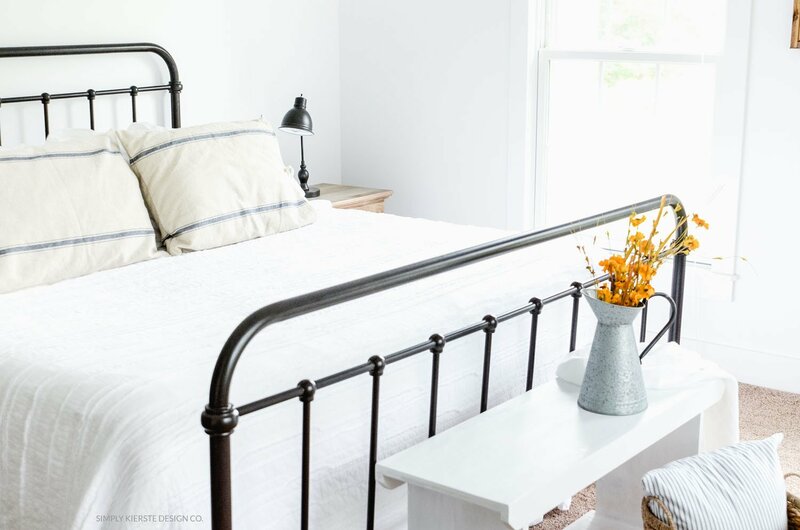 With the cooler temperatures and changing leaves, fall is nearly here, and my farmhouse bedroom is ready! Looks perfect, I need new sheets and these sound awesome! Love, love, love! BHG’s furniture line is blowing my socks off. LOL It looks like high-end furniture without the high-end price. Gorgeous room too Kierste! I love your look! Where did you get your headboard? Love❤️All the ideas! 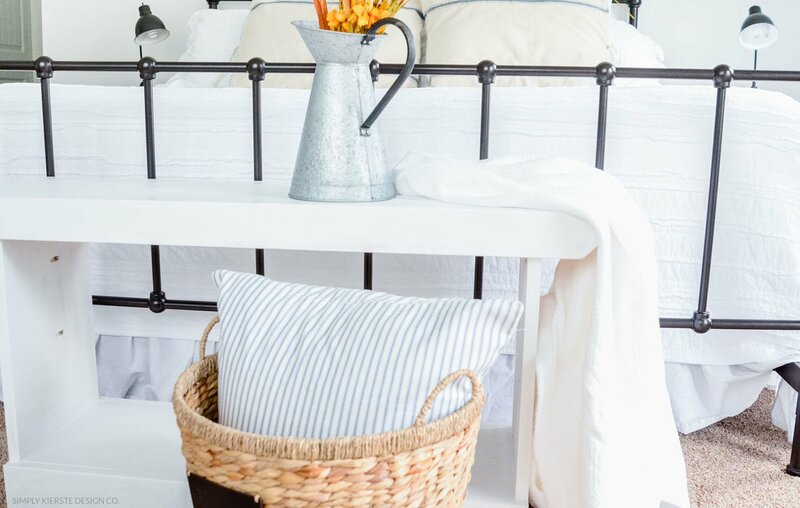 Are these the nightstands you have in your master bedroom? I ordered the bedframe!